If you’re looking for custom foot orthotics in St. Albert or Edmonton, you’ve come to the right place. If you suffer from pain in the foot, knee, hip or low back then custom orthotics may likely help you find relief. We have used the Footmaxx orthotic lab as our orthotic manufacturer since 2003. Since then, we have fitted hundreds of satisfied patients in the St. Albert and Edmonton area with what we believe to be the most technologically advanced orthotics available. Advanced manufacturing materials allow Footmaxx orthotics to be extremely thin, yet very durable, ensuring a comfortable fit in most shoes. 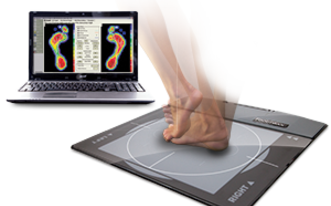 The computerized Footmaxx system allows us to analyze in detail how your foot moves with each step. In turn, this allows us to produce orthotics that provide functional support for your feet. The result is improved lower limb bio-mechanics and pain relief. Additionally, in 2009 we began to also utilize Kintec Footlabs for some of our orthotic manufacturing needs with very satisfying results. The Kintec lab uses an alternate system of assessment and manufacturing orthotics which gives you another option when orthotics are necessary. Kintec Footlabs is the official orthotic supplier for the BC Lions in the CFL.